ACC regular-season and tournament champion Virginia is the NCAA Tournament’s overall No. 1 seed and top seed in the NCAA South Region. AFP editor Chris Graham talks with Virginia players Kyle Guy, Jack Salt, Isaiah Wilkins, De’Andre Hunter and Mamadi Diakite after UVA’s 64-58 win over Clemson in the semifinals of the 2018 ACC Tournament. You can almost just go ahead and say, throw out the game tape from the 61-36 Virginia win over Clemson back in January. Virginia coach Tony Bennett likes it when his team touches the paint on the offensive end. Folks at the Barclays Center might want to touch up the court after all the touching the ‘Hoos did in their 75-58 win over Louisville on Thursday in the ACC Tournament. Top-ranked Virginia led by as many as 17 in the first half, then withstood a Louisville rally that cut the margin to four with 8:55 to go, before pulling away for a 74-64 win on Thursday at the ACC Tournament. The Paramount Theater welcomes the community to cheer on the ‘Hoos as they play in the 2018 ACC Tournament quarterfinals with a free live broadcast on Thursday at 12 noon. Narratives change so quickly in March. About noon Wednesday, Louisville was trending downward, having lost seven of its last 10, including the inexplicable last-second loss at home to #1 Virginia that seemed to foretell NIT and not NCAA as the program’s postseason destination. No. 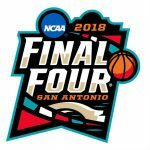 1 seed Virginia (28-2) plays No. 9 seed Louisville (20-12) in the ACC Tournament quarterfinals on Thursday, March 8. Tipoff at Barclays Center (17,732) is set for Noon ET. Virginia D doesn’t seem to be forcing as many turnovers: Impact? As recently as the first Louisville game, back on Jan. 31, the story with the Virginia defense wasn’t that it was ranked #1 in the nation in efficiency, fewest points allowed, etc. That’s dog bites man, agate at best, basically. Virginia is again #1 in the AP Top 25, and for the first time, the ‘Hoos are a unanimous choice. Virginia’s Tony Bennett was named 2018 Atlantic Coast Conference Coach of the Year, Isaiah Wilkins (Lilburn, Ga.) was named Defensive Player of the Year and De’Andre Hunter (Philadelphia, Pa.) was named Sixth Man of the Year, announced by the ACC on Sunday (March 4). Virginia coach Tony Bennett and UVA players Isaiah Wilkins, Ty Jerome and Devon Hall talk with reporters after the Cavaliers’ 62-57 win over Notre Dame on Saturday. Virginia senior guard Devon Hall talks with reporters after the ‘Hoos defeated Notre Dame, 62-57, on Saturday. #1 Virginia won an ACC-record 17th conference game, finishing off Notre Dame late in a 62-57 triumph in Charlottesville on Saturday. Top-ranked Virginia (27-2, 16-1 ACC) closes out the regular-season by hosting Notre Dame (18-12, 8-9 ACC) during Senior Day on Saturday, March 3. Tipoff at John Paul Jones Arena (14,623) is set for 4 p.m. Chris Graham leads our live coverage. Top-ranked Virginia (27-2, 16-1 ACC) closes out the regular-season by hosting Notre Dame (18-12, 8-9 ACC) during Senior Day on Saturday, March 3. Tipoff at John Paul Jones Arena (14,623) is set for 4 p.m.
Virginia is 16-1 in ACC regular-season play for the third time in five seasons. The first two times, #17 proved elusive, with the ‘Hoos losing in overtime at Maryland in 2014 and on a final-seconds jumper at Louisville in 2015. So you’re saying there’s a chance: How improbable was that Virginia win? 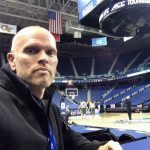 With nine-tenths of a second to go, Virginia trailing by four, the ‘Hoos had, according to Barttorvik.com, a 0.1 percent chance of winning. The No. 7-seed Virginia women’s basketball team (18-12, 10-6 ACC) picked up a 60-58 victory over 10-seed Georgia Tech (18-13, 6-10 ACC) on Thursday (March 1) in the second round of the 2018 Atlantic Coast Conference Women’s Basketball Tournament, being held at the Greensboro Coliseum in Greensboro, N.C.
#! Virginia trailed Louisville by four with nine-tenths of a second left. And, yeah, wow. Chris Graham and Scott German try to figure out how, and then try harder to explain it, probably without much luck, given that none of us have ever seen this happen before. Louisville led by four with less than a second to go, but two free throws by Ty Jerome, a Cardinal turnover, and a buzzer-beating three by De’Andre Hunter gave #1 Virginia a miraculous 67-66 win on Thursday. Top-ranked Virginia (26-2, 15-1 ACC) closes out its ACC regular-season road schedule by playing at Louisville (19-10, 9-7 ACC). Tipoff at KFC Yum! Center (22,090) is set for 8 p.m. Chris Graham leads our live coverage. Top-ranked Virginia (26-2, 15-1 ACC) closes out its ACC regular-season road schedule by playing at Louisville (19-10, 9-7 ACC) on Thursday, March 1. Tipoff at KFC Yum! Center (22,090) is set for 8 p.m.
Louisville went 9-for-10 from the field over an eight-minute stretch of the second half at Virginia back on Jan. 31, but back-to-back threes by Ty Jerome gave the ‘Hoos some space in a 74-64 win that was as atypical as any UVA game in the past five years. 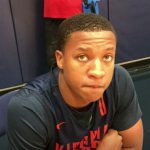 Virginia, unranked at the start of the 2017-2018 season, is the #1 team in the land for a third straight week. 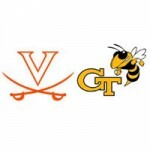 The Virginia women’s basketball team (17-12, 10-6 ACC) closed out the regular season with a 48-41 victory over Wake Forest (13-16, 5-11 ACC) on Sunday (Feb. 25) at the Lawrence Joel Veterans Memorial Coliseum in Winston-Salem, N.C.
Tony Bennett, the head coach at #1 Virginia, and UVA players Isaiah Wilkins, Nigel Johnson and Devon Hall talk with reporters after the Cavs’ 66-37 win at Pitt on Saturday. 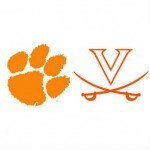 The Virginia women’s basketball team (16-12, 9-6 ACC) closes out the regular season by playing at Wake Forest (13-15, 5-10 ACC) on Sunday, Feb. 25, at 3 p.m. at the Lawrence Joel Veterans Memorial Coliseum in Winston-Salem, N.C.
#1 Virginia (25-2, 14-1 ACC) faces Pitt (8-21, 0-16 ACC) Saturday at 4 p.m. Chris Graham leads our live coverage. Top-ranked Virginia (25-2, 14-1 ACC) travels to Pitt (8-21, 0-16 ACC) for an ACC men’s basketball contest on Saturday, Feb. 24. Tipoff at Petersen Events Center (12,500) is set for 4 p.m.
Game Notes: Does #1 Virginia have anything to worry about Saturday at Pitt? 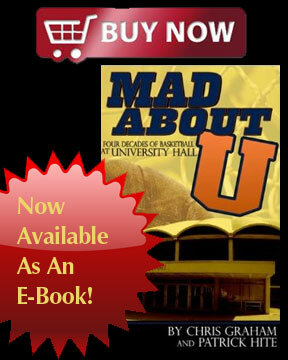 Short answer: no, #1 Virginia has nothing to worry about at Pitt, which is winless in ACC play through 16 games. The #1-ranked Virginia football team was undone in 1990 by a Georgia Tech squad that devised an offensive game plan based on what William & Mary had success with in an early-season UVA blowout win. 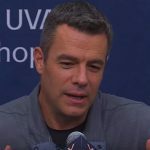 Virginia coach Tony Bennett and players De’Andre Hunter, Isaiah Wilkins, Mamadi Diakite and Kyle Guy talk with reporters after the top-ranked ‘Hoos defeated Georgia Tech, 65-54, on Wednesday. Kyle Guy and De’Andre Hunter talk with reporters after #1 Virginia defeated Georgia Tech, 65-54, on Wednesday in ACC hoops action. Top-ranked Virginia had to work a little harder than expected, but was eventually able to fend off upset-minded Georgia Tech, 65-54, on Wednesday. The Virginia women’s basketball team (16-11, 9-5 ACC) plays at No. 4 Louisville (27-2, 13-1 ACC) on Thursday, Feb. 22, at 7 p.m. at the KFC Yum! 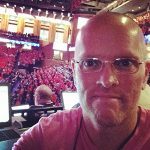 Center in Louisville, Ky.
Top-ranked Virginia (24-2, 13-1 ACC) hosts Georgia Tech (11-16, 4-10 ACC) in ACC men’s basketball action on Wednesday, Feb. 21. Tipoff at John Paul Jones Arena (14,623) is set for 7 p.m. In past years, Virginia coach Tony Bennett would schedule a non-conference game on the open date in the ACC schedule basically to maintain the pace and rhythm of the season at a consistent level. There were 35 years between #1 rankings for Virginia basketball. Now the Cavaliers are back in the top spot for a second straight week. 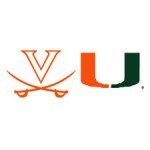 The Virginia women’s basketball team (16-11, 9-5 ACC) fell 77-62 to Miami (19-8, 9-5 ACC) on Sunday (Feb. 18) at John Paul Jones Arena in Charlottesville, Va. The Virginia women’s basketball team (16-10, 9-4 ACC) hosts Miami (18-8, 8-5 ACC) on Sunday, Feb. 18 at 12:30 p.m. at John Paul Jones Arena in Charlottesville, Va.
Virginia won its first game as a top-ranked team in more than 35 years, getting 22 points off the bench from De’Andre Hunter in a 59-50 win at Miami on Tuesday.